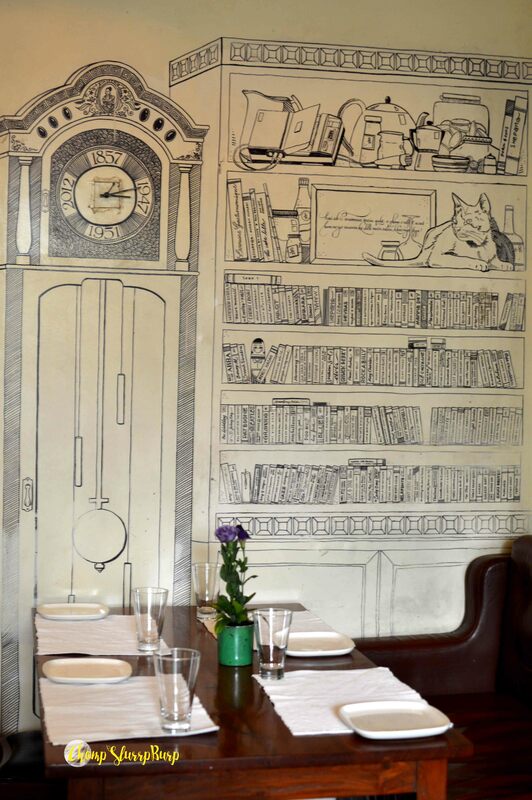 Our pick of Delhi's 10 prettiest restaurants - CHOMP! SLURRP! BURP! This is one of our absolute favorite cafes, we LOVE their Breakfast menu, their pop-ups, the Eggs Kejriwal, and just the general vibe. When at Cyberhub, my heart is always set at the gorgeous corner with flowers in teapots and all things vintage. At Khan Market, the train running overhead has the Sheldons in us piping with joy and the terrace is quirky, peppy and gorgeous. SBOW, for an authentic Parsi experience with Bombay favorites and so much prettiness. This boutique style cafe houses a gorgeous patio in the middle of Khan Market. White texture walls, hand illustrations, pop of yellows and oranges, fresh flower vines donning the place and a longing for open air Tuscany cafes. You can shop for pretty exciting labels and delectable food. The wacky upside down “IMPERFECTO” is the first thing to catch your eye as you enter Hauz Khas Village. Once a prime hangout spot, Hauz Khas still see loyalists coming to their favorite outlets. This quirky version with all the imperfections, fairy lights, Jackson Pollock inspired wall paints and the iconic chair, remains a hot party spot and the terrace gives one of the prettiest views for the fort remains. The famed place for Armenian x Bengali cuisine, Chef Saby and Chef Megha dish out delicious meats all year round with special winter and summer editions. With a view of the majestic Qutub Minar, they have a cozy outside area with a porch swing, colorful prints with thread work upholstery and the huge blue frames hanging inside just have my heart. The quirky, sophisticated cousin to Mamagoto, Mr. Mamagoto adds a vintage charm to Cyberhub with all its pop art, muted colors and floral juxtaposition with the traditional Asian art. The primary color splashes do add the Mamagoto touch to this fine dining restaurant. Also, their chicken liver pate and fried calamari are not to be missed. This authentic Asian restaurant is perfect for a fancy date night. Overturned cane baskets acting as lamps, and comfortable couches. The warm Asian vibe sets the mood just right and the sprawling glasses overlooking their gorgeous garden. Also, their wine selection is killer and the authentic Rendang curry, like no other. Olive, definitely does perfect interiors. The patio style dining with flowy curtains, natural greens, rustic interiors transport you right up. Add on their beautifully plated food and delicate yet delectable flavors, and you have a game changer. As the name suggests, this minimalist cafe is my personal favorite. Their clean lines, threadwork, pops of yellow dandelions and French windows are everything. Pick your spot near the windows and fluffy yellow cushions, a good book and their yummy breakfast spread. 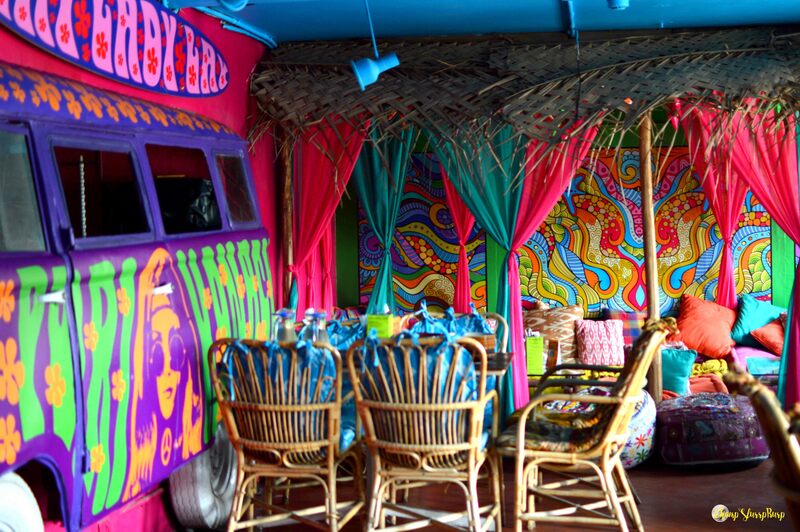 Goa feels in Delhi are synonymous with Lady Baga – shacks, low seating couches, fairy lights, and a sprawling bar. They have even fixed a minivan with bright colors and psychedelic patterns. Like Goa, their shots are so cool and we are totally in love with their Portuguese menu. If hand-painted illustrations get you going, this is THE place for you to check out. Although my favorite was at Hauz Khas Village with the fort illustrations overlooking the lake. The one at Khan Market has an old world charm, with quotes from famous quotes and capturing the essence of Khan Market with grandfather clocks, oldie telephones, and typewriter. The breakfast, steak and the new addition of waffles, yummy. Only 40 days to a new year, here’s to prettier times and more exciting food.